I’ve got quite a collection of Phoenix sunrises and sunsets. Brett Chappell, a Twitter pal and former U.S. Navy SEAL, says we live in Paradise, and I agree. 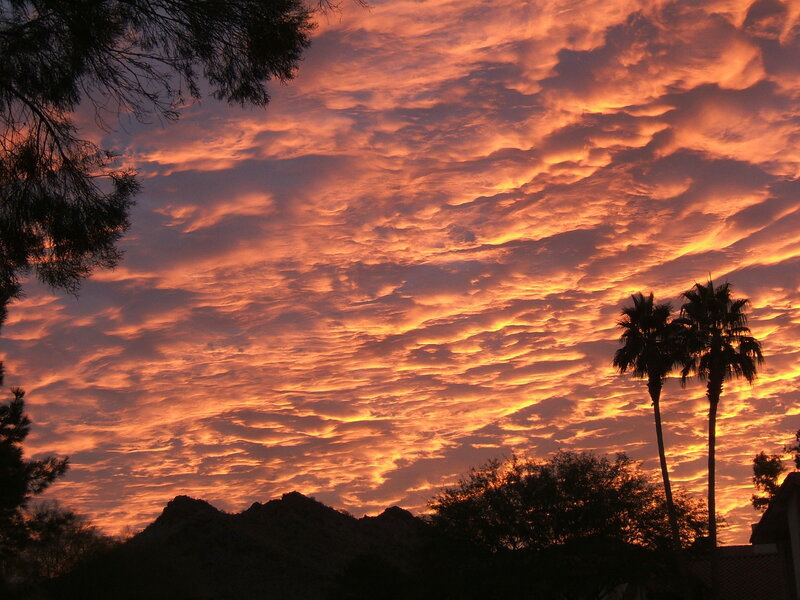 This cascading sunrise appeared over Shadow Mountain on Dec. 9, 2009. On Dec. 9, 2009, these coral, cascading clouds surprised and delighted local sunrise spectators. The Center for Performing Arts Gallery showcased digital photographs at a Digital Photography Reception held Feb. 25 from 5:30 to 6:30 p.m.
David Bradley, visual arts faculty at PVCC, estimated that 120 photographs hung in the CPA Gallery. Pleased with the amount of participation and open to all, he hopes to make this an annual event at PVCC. Each artist submitted up to five framed or mounted photos for display or sale at the exhibition. Photographs remain on display in the Gallery through March 12. PVCC students, faculty, staff and members of the community came to the free reception to view the photos, partake of food and beverages and talk with Bradley, adjunct faculty member and photographer Tony Nelssen and artists. Nelssen teaches the popular introductory digital photography class, ART 142. Instead of a cell phone or a firearm, Nelssen carries a point-and-shoot digital camera in a holster strapped to his belt, so he never misses a great photo shot. He teaches Photoshop techniques, answers questions on specific camera use and advises people to always visit the Web site dpreview.com prior to purchasing any digital camera. Bradley always finds innovative ways to get the campus and community involved in art. He found an opportunity to bring local artist Jane Kelsey-Maple to campus to design, create and teach a class in public art, which brought the public sculpture “Gateway to a Life-long Journey of Learning” to the south side of the CPA. At the moment, temporary paintings done on plywood grace the north and west entrances to the PVCC parking lots and will change every few months, says Bradley. Additionally, he says steps for another public art project are in the works. Instructor Jim Patterson appeared at the reception and displayed five photos: “Colors of Malaysia Celebration”, “Big & Rich Concert in Las Vegas”, “Stavanger Fjord, Norway”, “Sedona Church” and “Girl & Cat: Arab Street, Singapore”. Artist Anastasia Pagonas exhibited her colorful and unusual photo of a singer performing in the subways of New York entitled “Belting for Bread @ Bedford Av”. "Belting for Bread @ Bedford Av"
Pagonas also exhibited creative architectural and human interest works of art photographed in New York City: “5th Ave & the Eternal”, “Strand Bookstore, NYC”, “Love Thy Neighbor As Thyself” and “The Good News & Manhattan”. Puma Press photo editor, Forrest Rossi, showcased a patriotic self-portrait entitled “Rock the Vote”. PVCC Interim President Paul Dale took time from his busy schedule to view all of the photos and speak with students, staff and faculty members at the reception.